With The Enlightenment underway, Team Flash acquires an unexpected ally to help them stop The Thinker. Will it be enough? While not really a continuity gaff, it is still worrying that the mayor of Central City is willing to give Barry Allen his job back because of information posted to an anonymous blog, but not on the recommendation of his former boss or the basis that he was completely innocent of the crime of which he was accused. While what we've seen of the new mayor indicates that she is wholly obsessed with appearances and publicity, one would think the revelation of a murder victim appearing in court to defend the innocence of the man he once claimed was stalking him would be a bigger deal than some blog that only has a few thousand total views proposing that a respected college professor is a super-villain! The Mechanic claims that there was a time when Clifford DeVoe was nothing but good and truly wanted to help the world. That claim is directly contradicted by the flashbacks in 420, which revealed Clifford DeVoe to be a cynical, misanthropic Luddite. In earlier episodes, The Thinker claimed that he had to leave The Flash alive for some reason. In this episode, he claims it was because, with Barry now in his head, he had the capacity to take his powers and gain access to The Speed Force. If that was DeVoe's ultimate goal, why not just take Barry's powers like he did The Bus Metas at literally any other time before now that Barry was at his mercy? As cool as Ralph and Barry fighting the hordes of Thinkers is... why didn't Barry just run for the Nexus dragging Ralph behind him in the first place? Shouldn't Ralph have all of the powers that The Thinker stole from the other bus metas now? The moment where Cisco and Harry hug as Harry burns out the last of his brain with the Thinking Cap to help Team Flash one last time is magical and a great bit of silent acting for both Tom Cavanagh and Carlos Valdez. The lighting and lens flare effects used to create the world inside The Thinker's brain are quite effective at establishing an otherworldly effect. The idea of The Thinker existing as an electronic artificial intelligence is taken directly from the JSA comics of David Goyer and Geoff Johns. Here, the Justice Society of America developed an artificial intelligence to oversee the state of the art security system for their new base. Mister Terrific personally designed the system, which was based around the reformed Clifford DeVoe's "thinking cap" technology. Unfortunately, the AI achieved sentience, went evil and created a holographic form similar to what we see in this episode. It would return several times to fight the Wally West incarnation of The Flash and Cyborg and also served in The Injustice Society. The mystery speedster woman, who first appeared as a waiter at Barry and Iris' wedding is revealed to be Nora West-Allen, their daughter from the future. This character seems to be loosely based on Nora West II - a future speedster and daughter of Barry Allen, who goes by the code-name Cruise. Cruise was first introduced in Justice League #26 (Vol. 3) (October 2017). Physically, she resembles the New 52 version of Iris West. A more famous daughter of Barry Allen and Iris West is Dawn Allen. She, along with her twin brother Don, inherited their father's powers and went on to be known as The Tornado Twins. They first appeared in Adventure Comics #373 (October 1968). 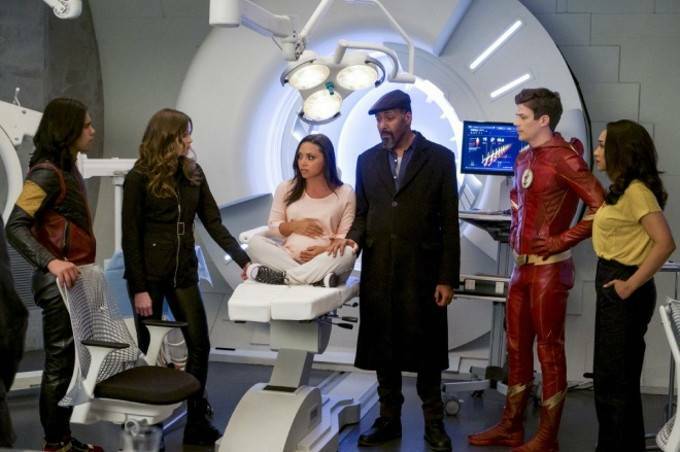 The Flash show-runners confirmed that they decided to go with Nora being the future daughter rather than Dawn Allen, because it seemed more likely that The Arrowverse version of Barry would want to name his daughter after his mother. Using Harry's cerebral inhibitor as a baseline, The Mechanic is able to construct a "one-way brain radio" that will amplify Cecile's telepathy so she can put Barry inside The Thinker's mind, used in conjunction with The Thinker's chair. Barry's mind is put into The Thinker's amygdala - the part of the brain that connects emotional significance to memories. The contractions Cecile experiences as she goes into labor put a strain on her trans-cranial link, disrupting Barry's connection to The Thinker. Caitlin is able to counteract this with the inhaler she gave Joe last week, which contains the drug terbutaline, which can be used to slow contractions. Kilgore's power to control technology also gave him the power of technological reincarnation - i.e. backing up his brain as a digital intelligence. The Thinker was able to transplant his mind into his chair using this power. The Mechanic is able to overcome this by destroying the power source for the chair. Vibe: (determined) I won't lose anyone else today. I won't. The Thinker: In this place I do as I please, Mr. Allen. I must say the fact that you thought I wouldn't have calculated you and your team making this feeble attempt is somewhat... insulting. There will be no defeating the big bad this year, Mr. Allen. See.. you are in my mind now. And there's no escape. The Thinker: Run, Mr. Allen. Run. Ralph: Allen, listen to me. I'm stuck here. But you're not. You should go. Be with your family for whatever time is left. Barry: No. No. Okay, first of all, it's our family. And I'm not leaving you behind. There's got to be another way. Ralph: Allen, you said the only way to save the world is by finding the good that's left in DeVoe. It's right here. With a hole in its chest. Barry: It's not the only good left in him. Ralph: Why the breaks? Are we there? Ralph: (looking to the Nexus) So that's the Hellmouth? Barry: That's the nexus of DeVoe's mind. Marlize said we can take control of him if the good in DeVoe passes through it. Ralph: Allen, we know that's not possible anymore. Barry: Why do you think he's keeping you alive?! I couldn't figure it out, but think about it! If you get out, you take back control of this body. Because it's yours! That's why he won't let you leave! Once you get out, DeVoe will cease to exist! All you have to do is make it through that portal, and you''ll regain control. Remember who you are, Ralph. A hero. The Thinker Hologram: I told you that The Enlightenment would come for you, Marlize, and it will. Remember I thought of everything. Even this moment. The Mechanic: (barely holding back the tears) Good bye, my love. Harry: Don't worry. You have been... and will always be... my friend. As the episode opens, Captain Singh is calling Barry to tell him that the Mayor of Central City has agreed to give Barry his old job as a CSI back. Captain Singh specifically credits Iris' blog and everything she wrote about Clifford DeVoe bringing about his rehiring, though it is unclear how he knows Iris is behind the blog when it was confirmed in the last episode that she posts to it anomalously. The Thinker uses Kilgore's powers, in conjunction with his satellites, to shut down most of the electronics on Earth. The title card for this episode, rather than the usual red streaks and yellow lightning motifs, features crackling synapses suggesting thinking. Caitlin has all the materials needed to deliver a baby in STAR Labs' medical bay. The Thinker is revealed to have predicted that Harry would build his own Thinking Cap and attempt to augment his intelligence further with Dark Matter. Through this, The Thinker used Harry as a guinea pig to see if his plan to use Dark Matter to decrease the collective intelligence of humanity could work. It also allowed him to use STAR Labs resources to siphon off the Dark Matter he needed. The Mechanic explains that The Thinker specifically created The Bus Metas to give him the unique combination of powers needed to counter any of Team Flash's allies. This is why Barry can't call Supergirl or Green Arrow or The Legends for back-up. The nexus of The Thinker's brain manifests as the opening to The Speed Force from which Barry emerged near the 405 CC Metro Bus. Barry checks The DeVoe's house in Central City first for signs of Clifford DeVoe. He finds it empty of furniture or any kind of decoration apart from an empty picture frame with cracked glass. When Cecile touches Caitlin, she says "I found Thomas. He's been this way all the time." Caitlin seems to have some idea what this means but shrugs it off when Joe asks her about it. Harry uses his Thinking Cap one last time to make himself articulate enough to tell Cisco that Barry should go to the place where Clifford DeVoe first kissed his wife to try and find the good that is left in The Thinker. This leads Barry to Ralp Dibny. Ralph and Barry find the good part of Clifford DeVoe in his classroom, dead of a wound to the chest. Barry determines that The Thinker had to keep Ralph's consciousness alive in order to keep his body alive. This means that Ralph should be able to pass through the nexus and reassert control over his own body. Iris refers to Joe's line about strength, without faith, meaning nothing from 401. Ralph is able to fight The Thinker by clearing his head and thinking about something he loves - i.e. shrimp. Barry does the same thing by thinking about Iris. Cisco recognizes the random words Harry says as being identical to the stream of words Barry said when he first emerged from The Speed Force in 401. Caitlin assisted with several births in medical school. The Thinker briefly returns as a hologram through a back-up of his mind stored in his chair. The Mechanic destroys it by pulling out the power supply of the chair. Before it "dies", however, the hologram is able to take control of STAR Labs computers and pulls their satellite, "Sally" out of orbit, by increasing its mass by 1000 fold, setting it on a collision course with downtown Central City. The mystery speedster is seen running behind Barry as he attempts to punch the falling STAR Labs satellite, helping him to atomize it with a supersonic punch. Barry realizes, after the fact, that another speedster was there helping him. The Mechanic develops a treatment to restore Harry's mind. She says it is the first of many things she must make amends for. Iris offers The Mechanic a place on Team Flash. She declines, saying she is going to go somewhere she can use her talents to help people in need, like she did before she signed on with her husband's crusade. The Mechanic's treatment is able to restore Harry Wells' to an average level of intelligence. Harry says he thinks his mind and heart are in balance for the first time in his life. Iris gets Star Wars and Star Trek confused. Harry elects to return to Earth Two and rebuild his relationship with his daughter, Jesse. Wally West arrives just in time for the party celebrating the birth of Joe and Cecile's daughter. Joe and Cecile's daughter is named Jenna Marie West. Wally says that he thinks he found what he was looking for and that being a Legend has helped him to become comfortable with just being himself and not worrying about being in Barry's shadow. Iris says she doesn't want to have children for quite some time. The line "This house is bitchin'" from 401 is revealed to have been said by the mystery speedster. The mystery speedster is revealed as Nora West-Allen - Barry and Iris' daughter from the future. Ralph and Cisco remember seeing Nora at C.C. Jitters in 411 when she paid for their coffee. Caitlin remembers Nora spilling a drink on her in 415. Joe and Cecile remember Nora delivering a gift to them in 420. Wally makes reference to Nora having posed as a waiter at Barry and Iris' wedding in S308. Nora wears the jacket from Iris' costume from 416. Nora makes reference to having screwed something up with the timeline. The pocket dimension The DeVoes created. A surprisingly solid conclusion given how uneven the season as a whole has been. There are quite a few logic gaps and plot holes, but very few things that can't be hand-waved. We have Ralph back, which is good. We don't get any resolution to Caitlin's storyline, which is, sadly, par for the course for her, it seems. Still, with Blacksmith still at large, we may see Caitlin having a larger role in things in Season 5, which would be welcome... assuming they decided to bring her back, which is a big if. Sadly, the big lead-in to Season 5 - Barry and Iris's daughter from the future has followed in her dad's foosteps in breaking reality by changing the past - was wholly predictable and doesn't suggest that the show will be treading any new ground next year. Then again, given how badly trying to break the mold this year went... well, maybe another season of dealing with paradoxes won't be so bad.